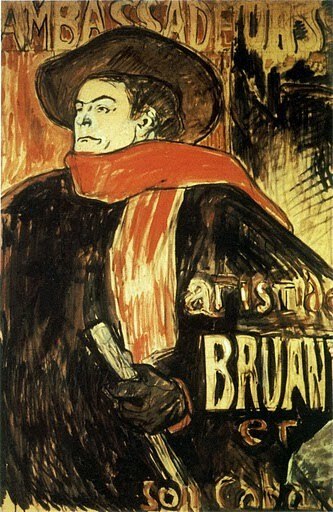 Aristide Bruant cut a dashing figure in his red scarf, black velvet jacket, matching red shirt and boots. In his portraits by Toulouse-Lautrec, he is the epitomy of the Bohemian 'artiste'. Born in Cortenay in 1851, the young Brunt grew up in a middle-class family. When his father died when he was just 12, however, he had to come to terms with poverty and join the workers. He became a jeweller's apprentice at 12. After that he worked for the Northern Railway's Company. He started travelling to Paris where he found another world - a world of music-halls and clubs that he wanted to join. The young boy with stars in his eyes left home at just 15. He started his own singing and comedy act which impressed the club, Chat Noir. He was engaged by the club and eventually became its manager. Bruant changed the name to Le Mirliton. The handsome singer became very popular. He dabbled in anarchist politics and sympathized with the struggles of the workers. He wrote songs that have been called 'narratives of poverty and prostitution'. These were called 'naturalist songs' and were in the same tradition as Zola's great realist novels about life on the streets and the sorrows of the working-class and poor. Bruant's audience was mostly middle-class and he loved to insult them. He called them names like 'pig' and 'prostitute'. Whenever a woman came in, she was greeted by an audience chorus of: "Oh, How pale she is." Surprisingly, the audience loved all this. The only person that he greeted nicely was his great friend, the artist Toulouse-Lautrec. When he came in, Bruant told the audience to welcome the 'great artist'. Bruant was one of the artist's first friends and helped his work become known. He commissioned a portrait for his poster for the club, Les Ambassadeurs, which is still one of Lautrec's most famous paintings. Aristide Bruant was a great showman, who became a star of Montmartre, and made a lot of money. He eventually retired to run a farm, but he made a brief return to the stage at 73. He put on an act at the Empire Theatre and made a gramophone recording. I have seen many posters of Aristide Bruant, but I knew nothing more of him except that he was manager of Le Chat and a very dashing showman. I am glad he had left wing politics - too many people from a tough background forget the class struggle as soon as they Made It themselves. Did women find him attractive? Men? Thank you very much for your comment, Hels. I can imagine that both sexes probably found Bruant attractive. I really like his outfit! He must have been quite handsome to look good in it, I think. Unfortunately, I haven't found any info on his private life. I wonder if he got married? I will keep looking. I also don't know very much about his politics. I don't know whether he helped people, for example - maybe writing the songs was enough.